The first thing to know about your October tiyul to the Negev is that Yossi Garr, Director of Nativ, will describe this trip to your bewildered and excited group as “An easy hike, nothing too difficult.” This is false, and will be a source of sarcastic laughter and minor resentment in those moments that you are trekking up the most tremendously steep inclined craters that you ( a Miami raised, arguably weak and small eighteen year old) have ever seen. This is okay, because it is truly the toughness and strenuous nature of the three day hike that form the much more interconnected bonds between your track. When your knees are wobbling more than cups on a table during a lively Birkat Hamazon, it is the helpful extended hand of your peer that will allow you to continue and reach the end with a satisfied smile, labored breathing, and only minor scratches and bruises. The next thing to know is that you will think that you cannot do it. You will look at the beginning of the trail at 8:00 AM and will feel a twisting in your gut resembling that of the entrance to your final exams in high school. ‘What if you are the slowest hiker and everyone judges you?’ ‘What if you just don’t have the strength to carry through all the miles?’ The key in this is that there is no way to resolve those nerves other than taking deep breaths and pushing yourself forward. Each of us, no matter body type or history of asthma, were capable of completing the journey. 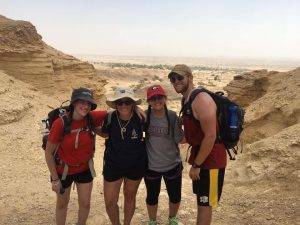 That was one of the most beautiful things about this tiyul–every Nativer made it to the end, regardless of degree of fitness or skill in hiking. Whether one person needed to stop and take puffs of their inhaler every hour and the other could run circles around the group, we went at a pace comfortable with everyone, and cheered each other on with the most genuine support and care. The mental barriers that rooted us in our fear and anxiety were the strongest handicaps to reaching the end. This is not only a reflection of the hike, but one that is apparent in our everyday lives as well. So often we are too afraid to step outside of our comfort zones (try new things, initiate conversations, etc) because we are terrified of judgement or poor outcomes. So this as a broader lesson: take deep breaths and blind leaps more often (within reason). Courage is a skill that needs cultivating, and is up to both you and the structure of Nativ itself (through Tiyuls like these) to grow. Beside his comment on the supposed painlessness of the hike, another message from Yossi Garr about our time on Nativ was to “take advantage of opportunity time”. This is to say that we should not just spend each day with the same people in the same places, or to excessively nap (unless we need it), but to explore and meet new people, become interwoven in the community, and establish more meaning in our time here. This cannot be achieved if we are too anxious or nervous to open ourselves to potentially momentous and life changing experiences. On more tangible tips: bring snacks, wear sunscreen, put deodorant on your inner thighs so that you do not chafe beneath the unforgiving desert sun, drink your four liters of water, and stretch so that you do not cramp. Do not use your phone, even when you find bars of service on the peaks of mountains, because this is a time to shut down the distracting facades of our online worlds and immerse ourselves in the physical people around us, the beauty of nature, and the sound of silence. Now go forth and enjoy the breathtaking views of the desert in the arms of true friends-we sure did!